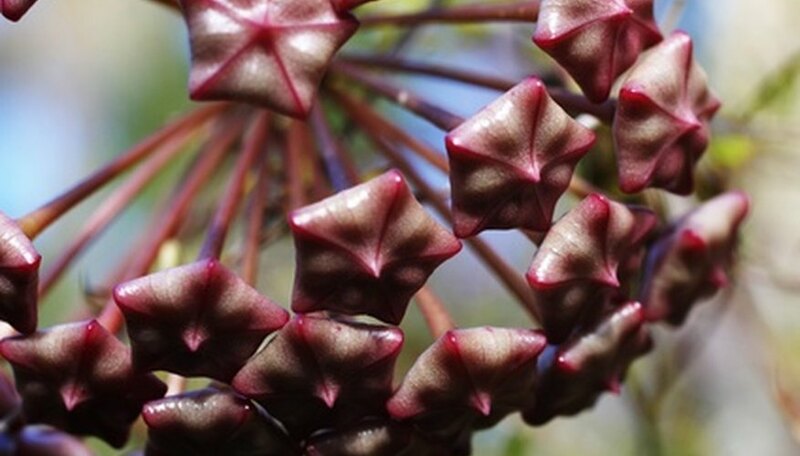 Hoya plants are attractive, climbing succulents native to parts of Southeast Asia and Australia. Sometimes called the "wax plant" or "wax vine" due to the waxy appearance of its leaves and flowers, these plants are popular for their shiny, jewel-like flowers that have a pleasant fragrance. There are 200 to 300 species of Hoya, according to the University of Illinois, and they all have leaves and flowers that range greatly in size, variegation and color. Hoya carnosa is perhaps the most commonly-grown hoya, according to the University of Illinois. It is a woody vine that has long (up to 4 inches) ovate leaves. This variety has delicate-looking white or light-pink flowers that can last for months. The plant is quite hardy and will tolerate drought and low-light conditions. This slow-growing hoya is also evergreen, making it an excellent choice as a container plant. Hoya compacta is often called the "Hindu rope plant" for its hanging vines covered with contorted leaves that make the vines appear somewhat like thick coils of rope. Its leaves vary widely in color, appearing glossy, deep green, cream, pink or variegated in all three colors, according to the Cactus and Succulent Society of America. This hardy plant is also a slow-growing variety of hoya and should only be watered when the soil dries out. Hoya australis is one of the best-known varieties of hoya. As the name implies, it is native to Australia and features very light-blue, almost white, flowers with deep, scarlet centers. This variety is especially fragrant at the beginning of dusk and lasts through the evening. Hoya bella has creamy white, star-shape flowers with lavender or purple centers and leaves that are either solid green, bright green or variegated cream and green. This variety is a climbing hoya and will flower continually through the summer if given at least some sunlight (dappled shade is good) and if the air is not too dry.